The image above appeared in a blog post of ours called "18-Oct-15: Being aware of our neighbours' passion for terror is the first step" some weeks ago in response to the orchestrated campaign of face-to-face Arab-on-Israeli violence going on all around us. Since then, there have been dozens more stabbings, shootings and car-rammings. Yesterday, there were multiple such attacks. But one of them is in a class of its own. It's the subject of this post. The photo [in that post] indicates at least one of the attackers is young - to our eyes, 15 or even less. The second attacker is not shown; he was evidently shot and is probably not in good shape. We don't know names, or where they live, or the condition of the one shot... [T]he Light Rail security guard, who was moderately wounded in the attack, managed to fire his weapon toward the two attackers, wounding one according to the police. He received emergency treatment at at the scene and then rushed to Jerusalem's Shaarei Zedek Medical Center. He is about 25, and has stab wounds to the upper body. A life changing experience for the guard who, thankfully, is said to be doing well today at Shaarei Zedek Medical Center in Jerusalem. And the attackers? It may have changed their lives too. Or not. What we know about them is mundane and not very revealing other than that, on any view, they are children and cousins. Times of Israel says both Moawiyah Alkam and Ali Alkam live in the northern part of Jerusalem, one in Beit Hanina, the other in the Shuafat neighborhood. The one who was shot (according to this source, the younger of the two) received emergency treatment at the scene from Israeli paramedics and was then rushed to Jerusalem's Hadassah Ein Kerem hospital. The initial report had him in serious condition, unconscious and on a ventilator while the second child is evidently unhurt, and held by police after a court order today authorized seven days of detention. The boy who was shot is today described as being in moderate condition. Lucky for him, the medical treatment provided by the Zionists he has been raised to loath is helping to save his life. The Arabic-language social media are, as we have come to expect, completely with the boys. 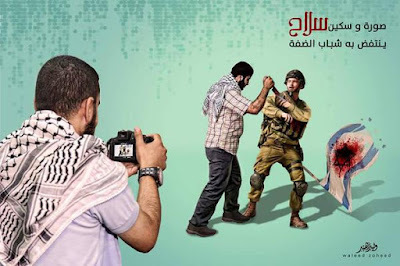 The Hamas-aligned Shehab news agency, based in Gaza, posted an outraged Tweet yesterday [here] with an embedded video clip [here] showing Israeli security personnel vigorously checking one of the two boys for concealed weapons. "Brutal occupation" are the opening words. Another Arabic-language twit says the arrest of the knifers was "barbaric". The atmospherics could hardly be clearer: there was an act of evil, in the eyes of the Arab world, and it was done by the Israelis against the Palestinian Arab boys. No other approach is visible when you look at their news reports and social media. And why, it might be asked, does a failed act of attempted murder need to be avenged? Because those attacks are ritually turned on their heads in the Arabic media, with the attackers portrayed as victims, and the victims demonized and presented as usurpers and colonizers. It's a dangerous, immoral and expensive strategy - expensive in terms of Arab lives lost and wasted. The abuse of the Alkam children continues today. One of their uncles, according to Times of Israel, does not believe they were even involved in the attack. "...I will tell you the truth, we have no faith in the police. We have already seen in other cases, in Hebron and even in Jerusalem, they make up stories and even killed a Jew they suspected of being an Arab,” Sheikh Abdullah Alkam said Tuesday afternoon, referring to the shooting death of a yeshiva student during a confrontation with troops last month. “Maybe they planted a knife on them, I don’t know. We want to first check what happened. I’m their eldest uncle and I was to check everything carefully." Which is as good a case as any for sticking knives into security personnel on a fancy and fast tram that brings Palestinian Arabs from their version of hell into the heart of modern Jerusalem. But it's clear the real hell for them and their uncles is in trying to make sense of modern, open, bustling, prosperous Jerusalem where Arabs are treated more or less like Jews, and where bullet wounds are treated by hospital staff - Jews, Christians, Moslems - who don't give a damn about the political craziness their patients carry around between their ears. How they cope with this, given what's pumped into them by their social media and newspapers and uncles, is a puzzle. What does life offer yesterday's child attackers? Very likely the unconditional support of family and community who will stand by them through thick and thin, through criminal charges of attempted murder and terrorism. What comes with that is constant exposure and reinforcement of the sort of message that the poster at the top of this article conveys: the higher purpose of young Arabs is to kell them some Israelis. What that will not include is religious, moral or ethical doubt. If they have encountered doubt so far, it's not evident in their lives or the lives of the other perpetrators of terrorism whose deeds we have examined from a distance. All this makes for near-impossible relations. How do you make peace with people who hate the very notion? We know. There are readers who believe there are sober, serious voices among the Palestinian Arabs calling for tolerance, compromise, an end to acts of violence and terror, a better life for their own sons and daughters. Trouble is, as much as we want to hear those voices, they are impossible to find [see "11-May-14: Still searching for outraged moderate Palestinian Arab voices"]. Instead, the length and breadth of their society is infected with messages of hatred, the fabrication of blood libels to ensure even more acts of hatred, a cacophony of perverse calls for more killing, more revenge, more "heroism" of the sort that yesterday's two boys with knives embody.